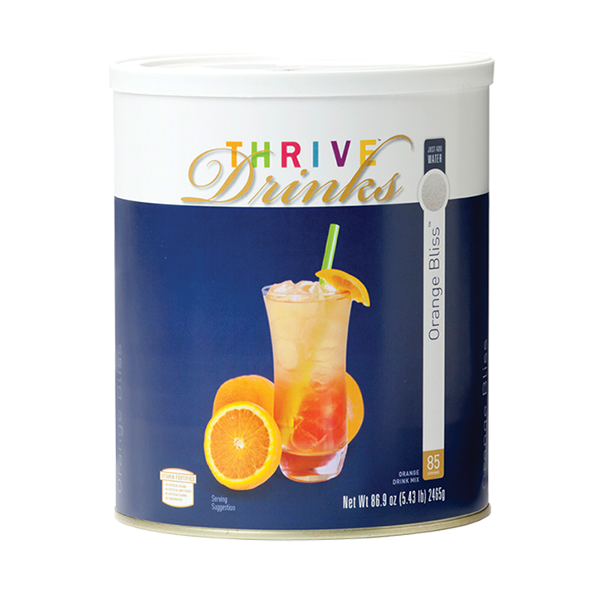 Made with real fruit powder and natural flavors, Thrive Orange Bliss is a naturally refreshing way to quench your thirst. It's fortified with vitamins so you'll stay energized throughout the day. CANE SUGAR, ORANGE JUICE POWDER (MALTODEXTRIN, ORANGE JUICE SOLIDS, ORANGE OIL), CITRIC ACID, NATURAL ORANGE FLAVOR, VITAMIN BLEND (ASCORBIC ACID [VITAMIN C], MALTODEXTRIN, D-ALPHA TOCOPHERYL ACETATE [VITAMIN E], ZINC SULFATE, BIOTIN, AND 2% OR LESS OF EACH OF THE FOLLOWING: NIACINAMIDE [VITAMIN B3], VITAMIN A PALMITATE, CHOLECALCIFEROL [VITAMIN D3], PYRODOXINE HYDROCHLORIDE [VITAMIN B6], CYANOCOBALAMIN [VITAMIN B12], FOLIC ACID), NATURAL COLOR. NON-GMO: NO BIOENGINEERED INGREDIENTS. PROCESSED IN A FACILITY THAT HANDLES MILK, EGG, SOY, WHEAT, AND TREE NUT PRODUCTS.